Having worked in service providers delivering DBA (Database Administration) outsourced support for over 17 years, I have interviewed a LOT of DBA’s across all levels of experience and I’ve always been surprised how hard it is to find the right mix of attitude and skills. Attitude for me always prevails with an appetite for learning, as skills can be taught. We are in a time when the DBA’s world is starting to be disrupted, workloads are moving to the cloud, open source database technology is growing in adoption and internal demands from development teams need a more iterative support model. The traditional “one vendor” DBA job role is under pressure, for me the DBA is the champion of a company’s data (one of the most critical assets) and now is the right time for the DBA to stick up their hand, start innovating and force the disruption on their terms, before someone else does it for them. Most importantly, take off the blinkers and become a universal database specialist don’t just hug one vendor’s technology and approach. Discovery: You need to check that those pesky developers haven’t spun up databases on their own environments. Database sprawl is a common problem, grab yourself a network discovery tool and audit what the full install base looks like. Licence Ouch: Now you know what is installed check what you are actually licenced for. Is there a gap? At some point you need to man (or lady) up and face this, work out the financial cost of what you need to pay for a true up and save this for your business case as it could create the financial need for change. Talk to the business: Get out there talk to the departments and get a better understanding of the data, applications, platforms and what the needs are of the business over the immediate and long term. Be honest, are you giving them what they need and are you actually using the right tools for the right job in terms of technology choice?. Set up an account on AWS or Azure and start building (other good IaaS platforms are available!). You’ll soon find your skills around performance tuning and building highly available architectures become very important. Learn how the platform APIs can start to help you automate processes. There is a wide range in functionality, maturity and tools, what benefits (if any) do these provide to your business? How can they complement the existing database environment? Look at the typical use cases, most of these vendors are winning in different sectors and project types. You know what the business wants and this may or may not involve new technologies. What you can do is start to ensure that the DBA service being delivered to the organisation can move to a more agile internal Database as a Service model and to do this you need to think like a service provider. Tiers of service. Think about how to offer a database service based on different tiers. This allows you to articulate your capability in business terms. What choices are required: Availability, Functionality, Performance, Price etc..
Where possible try to decouple the application and database layer. Build in technology choice for example you could offer SQL Server, Oracle and then maybe a NoSQL option. Maybe to start with only give NoSQL a low SLA and recommend for development use only as your skills and support capability grow. Ruthlessly drive automation to speed up the time it takes to handle requests and maintenance tasks. Look to develop self service capability for the development team and integrate with DevOps tools such as TeamCity, Jenkins & Chef. Working for a service provider across many clients, every day I am involved with discussions around new business requirements and the changes this has on the database tier. More often than not these discussions don’t include the DBA team. Why? Well mainly because they can be viewed as a vendor specific resource and invariably these changes involve technologies or platforms outside of their skills. 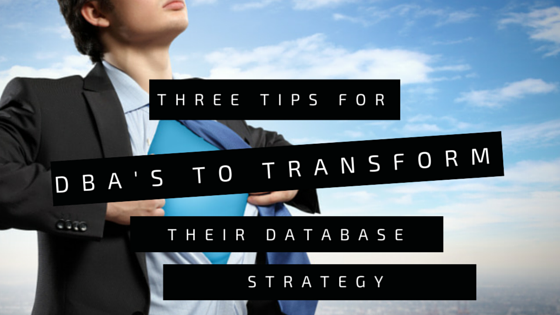 I appreciate this isn’t always the case, but it is a common theme and I believe now is a great time for DBAs to review their database strategy and look at transformation. If this resonates with you, but you just don’t have the time or you want to do this “yesterday” please get in touch and our consultants can provide the experience to review your strategy and provide the support you need to get you moving in the right direction.